Jeff is passionate about Commercial Real Estate Brokerage and is focused on identifying opportunities and developing value added solutions, always taking into account the needs of the client. Jeff values honesty and integrity and has developed a reputation for always doing what he said he would do, a mindset that he’s carried with him into numerous investment opportunities, business ventures, and personal pursuits. 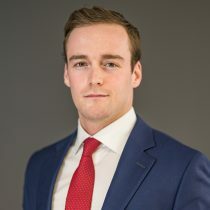 At Cushman & Wakefield Waterloo Region, Jeff provides individual and corporate clients with national real estate services utilizing local market knowledge to meet core business requirements.